There is no one specific underlying reason for lameness to occur in a horse. It occurs in all breeds, sizes, confirmations, and disciplines of horses. Reasons for lameness can be anything from pain in the horse or the conditions the horse lives in. The Merck Veterinary Manual defines lameness as “An abnormal stance or gait caused by either a structural or a functional disorder of the locomotor system”. It manifests with symptoms like inflammation, swelling or pain, and defects like limping. Depending on the type, fractures can fall into either category of primary or secondary. There are many things that you can look for when trying to detect lameness in a horse. Early detection may be hard. Once you start to notice your horse acting lame, it is always best to contact a vet immediately. When a horse is starting to go lame, the first place you may feel it is when riding your horse. It may not be visible from the ground yet, but often you can feel a difference in your horse’s movement while riding it. You may also start to notice changes in your horse’s attitude if they are not feeling 100%. Their performance might decrease, or they might be harder to work with. In severe cases, horses may even refuse to bear weight. When buying a horse, it is always smart to have your ducks in a row and look for potential signs that problems could be developing. We recommend that you have a vet perform a pre-purchase exam on any horse you are looking at buying. Pre-purchase exams involve a vet assessing the horse for lameness or confirmation issues. They will also check the overall health of the horse during the exam. You can also check the history of the breed you are buying. Different types of lameness are more common in different breeds of horses. The next exam your vet can perform is a movement exam. The vet will be watching the horse’s movements (mostly at a trot) to see if anything is visibly sore or painful. It should help in determining the location, type, characteristics, and severity of lameness occurring in the horse. It is typically conducted on a hard, flat surface. The two exams mentioned above might give your vet enough information to plan treatment without any further testing needed. If not, there are a few more things your vet can try to detect the cause of lameness in a horse. Nerve/joint blocks (anesthetics) can be administered into the hoof to cause numbness in a certain area. Once the area in question in numb, another movement exam would be given to the horse to see if the numb area is what is causing lameness. Once the source has been detected, imaging can be used for further diagnosis. Radiographs, ultrasounds, bone scans (nuclear scintigraphy), CT’s, or MRI’s are all ways of getting diagnostic information. They are used to look at the bones, soft tissues, tendons, and ligaments. 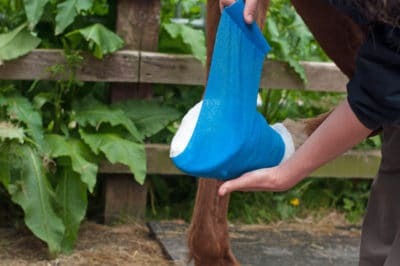 While expensive, they can be useful in determining the cause and prescribing treatment for severe or chronic lameness. Once the source has been correctly identified, your vet can help recommend a treatment plan. The treatments vary depending on the factors of your horses’ lameness. Some common standard treatments are injections, anti-inflammatories, and depending on the severity, surgery. Injections and anti-inflammatories focus on lessening the amount of inflammation. Another option is specialized shoeing. Your vet and farrier can work together to create a shoeing plan to best help your horse avoid falling lame again. Though there is nothing we can do to fully prevent lameness from occurring, it also helps to make sure they are getting good nutrition. A good preventative joint supplement or hoof supplement can help decrease the odds of your horse falling lame. Though lameness is not completely preventable, knowledge and awareness can help you detect it early. It can affect all breeds and there is no one underlying cause. Since it can stem from so many different causes, it’ is important to work with your vet and make sure that it is diagnosed and treated properly. Have any more questions about lameness in horses? Feel free to ask us!